And we're done. 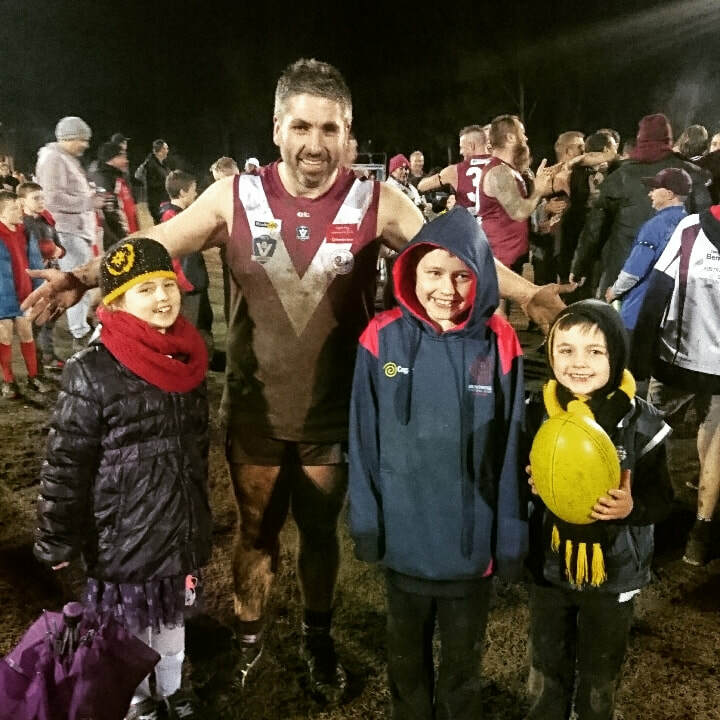 Post game, in the very recent glow of footy retirement. August 2018. Covered in mud, brow creased against the falling rain, I looked back at the ground as I made my way through the gate for my last ever footy half time. I took a moment to capture the miserable image in my inner camera’s memory drive and, like the playing surface with water, I was flooded with emotion. I was half way through my last game of footy, a grand final no less, and was approaching a life playing no competitive sport. I’ve always loved playing sport. It was two sports for me, footy and cricket. I was always better at cricket, and played a lot of games from age nine to about 33, but family and work made it obvious that I had to give it up. That was ok, at least I still had footy. I was never all that much good at it, which was part of the joy. I had absolutely no expectations of myself and could revel in turning up with no pressure and have a red hot crack at it. Scrapping and competing, fighting to make position, or out muscle an opponent, and then coming out with the ball and getting it out to the advantage of one of my more talented team mates was, for me, a joy. ​As I approach my 40th birthday and 200th game for my club I’m facing my mortality as a first eleven player. There’s no doubt that as you get a bit older you start to wonder if you could be bothered with all the extra stuff that comes from being a ones player, as silly as that might sound to those that don’t play at all or those that play Premier Cricket or above. There’s the extra time that you have to arrive at the ground before the game, the longer warm ups, the extra pressure as there’s always someone that wants to take your spot in the team or criticise your performance. There’s also the expectation that you train all of the training nights that are scheduled. Is this the best way for me to spend my Saturdays? My Tuesday and Thursday nights? Would I be better off just relaxing and playing in the second side or even the third? Would my time be better spent at home with my wife and our young children or does cricket provide the challenge, distraction and enjoyment I need to be relaxed and happy? The idea that I may have to play some second eleven cricket was flagged to me before the season began. At a meeting with the club leadership group they outlined who they thought would make up their best eleven if everyone was fit and available and my name was not listed. I reconciled myself with this notion and vowed to give the team and club everything I had regardless of where they picked me. I also noted that this was likely to be my last season. 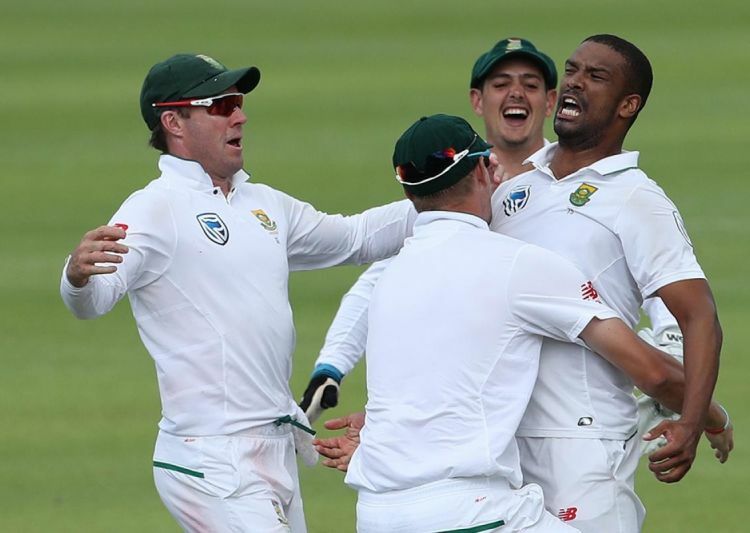 Vernon Philander celebrates during a six wicket haul against India. ​It promised to be a fascinating series & I haven't been disappointed. The two best Test cricket sides in the world facing off – India number 1 touring 2nd ranked South Africa. India fresh off handing Sri Lanka their biggest defeat in Test history with captain Virat Kohli imperious in that three Test series averaging 152, including two double centuries, one century & a fifty in only five innings. South Africa having made short work of Zimbabwe at home, bowling them out twice within two days after batting first. Much of the speculation heading into the 1st Test in Cape Town centred around the Proteas' 11. The Indian side was seen as settled but a fit Dale Steyn meant South Africa had an embarrassment of riches in their pace bowling stocks. Morne Morkel looked in ominous form with five wickets in the 1st innings against Zimbabwe. Kagiso Rabada, the 22 year old firebrand, was coming off a 2017 in which he took 54 wickets (second only to Nathan Lyon). Vernon Philander has a career bowling average of 22, testament to his uncanny accuracy & relentless consistency. Then there was Keshav Maharaj, the left arm orthodox spinner making an impressive start to his international career, who took five Zimbabwe 2nd innings wickets. Who would miss out? After a far too long wait, the Tigers players celebrate making lots of people happy in 2017. I’m not sure about the science, but it seems that after a build-up of pressure there will always be a letdown or an eruption. It was fitting that the one time the pressure on the Tigers in the last 37 years resulted in the latter and not the former it was built on a platform of pressure. And what an eruption. As the siren sounded young Richo tackled me around the waist with the ferocity of Jacob Townsend. “We did it, Daddy! We did it.” I felt guilty for agreeing, but did nonetheless. It was us, and all the other usses around the city, and the various cities, that had made Richmond something else altogether. Ramshackle amateurs, the scorn of sneering foes countrywide for decades, the next glorious minute the most potent and overbearing power in the land. It was the reckoning that our side had so long fought to witness, and the other had happily thought could never scourge the competition again. We had been too hopeless to turn it around. Even when we’d gotten better we’d found a way to stuff it up, to increase the pressure with yet more comical exits. 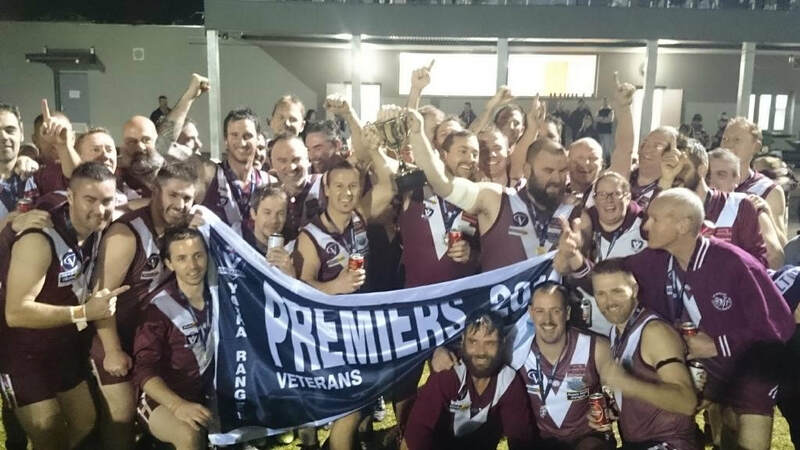 The pretty happy lads of the Mount Evelyn FC Vets after their 2017 Premiership, Emerald, 12/08/17. We were in control of the game at the start of the last quarter, all that was needed was a strong five or ten minutes and it was ours. Healesville had entered the competition aiming to win it, and their intentions after three quarter time had evidently not changed, as they slotted the first goal of the quarter. Within a minute we had slotted the next goal and, I can’t speak for my teammates, but reality dawned on me. We were going to win the premiership. Except, inexplicably, it didn’t seem real. I think my brain was battling two certainties. I’ve played and watched a lot of footy, and I knew without any doubt that the game was done. The result was in. Alternatively, I was also aware of the concrete reality that I, Greg Gibson, was destined to never win a flag. Sports writing by sports fans for sports fans.